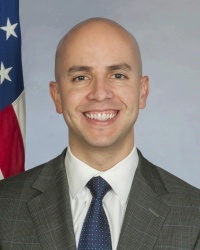 United States’ Deputy Assistant Secretary of State for Western Hemisphere Affairs, Juan Sebastian Gonzalez. Several high-level foreign dignitaries are expected in Guyana to join in the celebration of the country’s 50th anniversary as an independent nation. They are Commonwealth Secretary General, Baroness Patricia Scotland, the Prime Minister of Barbados, Freundel Stuart and and United States’ Deputy Assistant Secretary of State for Western Hemisphere Affairs, Juan Sebastian Gonzalez. Gonzalez, who is responsible for American diplomatic engagement and policy implementation in Central America and the Caribbean, will be representing US President, Barack Obama. They are expected to pay courtesy calls on Guyana’s President, David Granger during Wednesday, May 25, 2016 in the hours leading up to the Flag Raising Ceremony at D’urban Park in the night. On Wednesday, the Independence Float Parade including 27 costume bands from the public and private sector would move off from Stabroek Market Square to D’urban Park. That event is expected to conclude at 5:30 PM. In a message to Guyana’s National Assembly on Wednesday, May 24, 2016, President Granger paid tribute to the roles of labour and political leaders- Hubert Critchlow, Cheddi Jagan, Forbes Burnham, Peter D’Aguiar and Stephen Campbell- who all fought for independence from Britain which was eventually granted on May 26, 1966. “Guyanese, today, pay tribute to the generations of men and women who were part of this historic and heroic struggle for self-determination. We can enjoy freedom today because of their consciousness, their courage and their commitment to the cause of freedom,” said Granger. 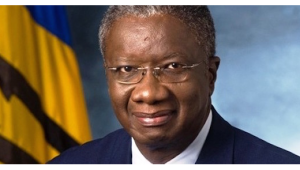 Barbados’ Prime Minister, Freundel Stuart. The Guyanese leader also said the 50th anniversary was a time to recall the martyrs of the Berbice, Demerara and Essequibo revolts during the dark era of enslavement and the martyrs of the protests at Leonora, Devonshire Castle, Rose Hall, Ruimveldt and Enmore, during and after the era of indentureship. The President also used the opportunity to highlight that Guyanese, today, pay tribute to their leaders, who had the vision to have guided, and the endurance to have sustained the nation during these past fifty years. He said Guyanese recognise the contributions of their eight Presidents − Arthur Chung, Forbes Burnham, Desmond Hoyte, Cheddi Jagan, Samuel Hinds, Janet Jagan, Bharrat Jagdeo and Donald Ramotar − in leading this nation over these difficult years. 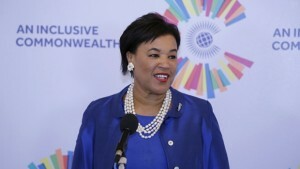 Commonwealth Secretary General, Baroness Patricia Scotland. The main opposition People’s Progressive Party (PPP), for its part, said it was the architect of Guyana’s political independence, a process that had begun with the formation of the Political Affairs Committee by HJM Hubbard, Cheddi and Janet Jagan and Ashton Chase. “The records would show that it was the PPP under the indefatigable and charismatic leadership of Dr. Cheddi Jagan that led the assault against the colonial system of governance which ultimately resulted in the granting of internal self-government and later, political independence,” the party said in a statement. The PPP added that the struggle for independence is inextricably linked to the broader struggle for a free and just society waged by the PPP since its very inception as a political party. While Forbes Burnham’s People’s National Congress (PNC) coalesced with the United Force (UF) to remove the PPP from office at the 1964 general elections, the PPP said it still embraced the achievement of independence. The United States had persuaded Britain to, among other things, change the electoral system from first past the post to Proportional Representation to ensure that Guyana was not granted independence under the PPP for fear that the country would have become another communist outpost for the Soviet Union.